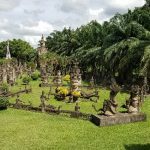 Laos a beautiful yet small country that not many people think of traveling to. 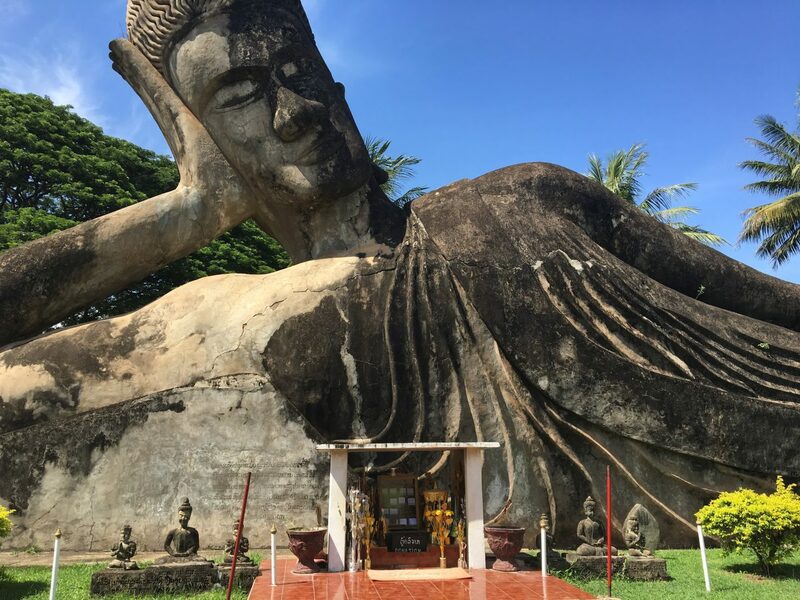 I came to Laos because I wanted to find out the roots of where I came from. Growing up in a traditional Mien(Yao) family I was curious about what life was like for my grandparents and where they came from. Throughout the six weeks here in Laos I have learned so much, the history, culture and basic Lao language. I went from playing charades with a Tuk Tuk driver to get to the place I wanted to go to, by saying “Sabaidee, Koi ow pai …. Le tow dai?” which was enough for me. Our Ahjan Bounme! He had such a lively personality and I am so thankful he was our teacher. Although in the beginning he thought I understood Lao and expected more from me, but thanks to him I now can actually understand some Lao. When I came to Laos I came with one friend, but when I arrived home I realized I had formed a family. 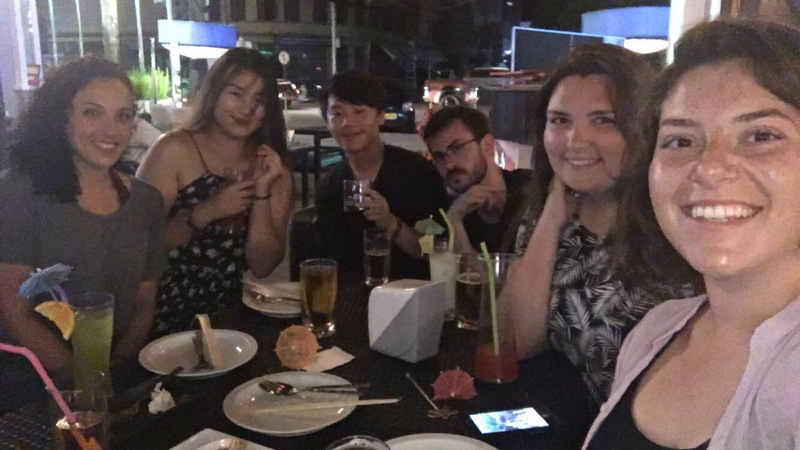 We all were complete strangers, but we had each others backs and I am so grateful to have met each and every one of the Sailers because without them I don’t know how I’d manage six weeks alone in a country I knew nothing about. Now for food! I won’t forget the restaurants across from school and the lady who was so kind to us and spoke enough english for both of us to communicate. Also around the corner from our hotel was a noodle/bun stand and I won’t forget getting buns almost every night for dinner because it was simple, fast, nearby and delicious. I’m sure they recognized our faces considering every time we walked up the ladies went straight to the steamer. As well as the same street vendor, a wonderful couple who were so kind and patient with us when we tried speaking in Lao. They too knew my order hehe. Sticky rice, chicken, papaya salad and sometimes eggs (: Last, but not least the wonderful Hard Rock Cafe in Vientiane. The place where we made amazing memories and amazing friends whom I will never forget. The time where we all came together and had an absolute wonderful time. As for our excursion to Luang Prabang, with knowledge that we were the first group it is absolutely so beautiful and highly recommended for the Next group of Sailers. 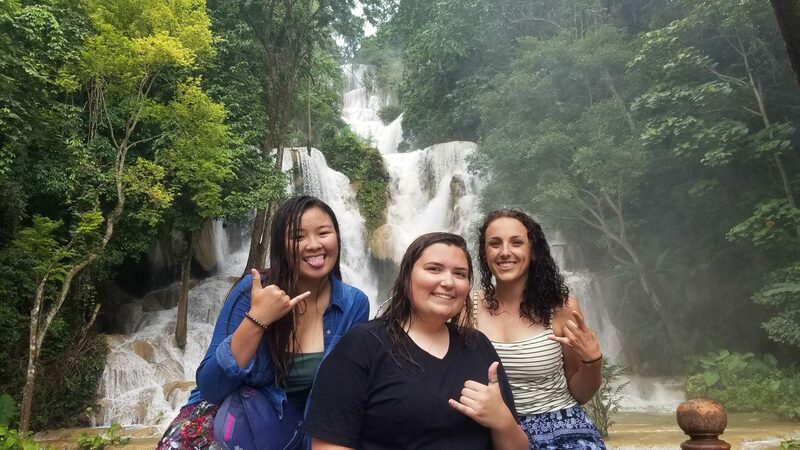 We were able to take a much needed break from school and fly to Luang Prabang where we all felt content. On the first day, right after landing and getting checked in at the guest house, we started our day. From going to find food to going to the beautiful temple called Wat Xieng Tong and then to the Royal palace which fun fact, I had the opportunity to be Lao for a day. 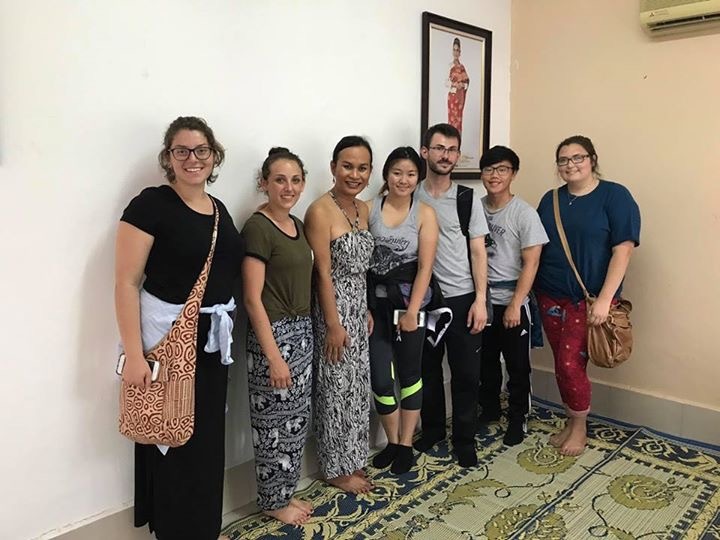 The next day in Luang Prabang we had a free day which consisted of biking around the city, stopping at Joma and Saffron to then receiving massages. After the massages instead of napping Ana and I decided to explore to La Pistoche where we finally got to swim! Afterwards we ended the night with getting dinner and exploring the beautiful night market. The next day we got to go to Kuang Si waterfalls which was a very long Tuk Tuk ride, but it was a scenic route passing by multiple rice fields and villages. At Kuang Si we all got to swim, in the not so blue water we were expecting, but a very fast current. To then going back to the guest house, but on the way back we stopped at a Hmong village. Which I’m sure touched every one of our hearts. 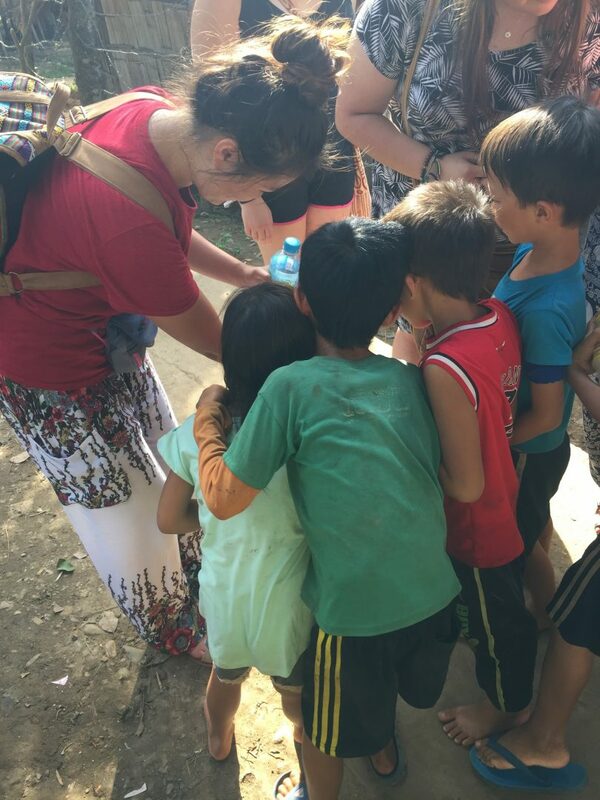 Buying bracelets from every stand and being able to interact with not only the elders or adults, but also the kids. 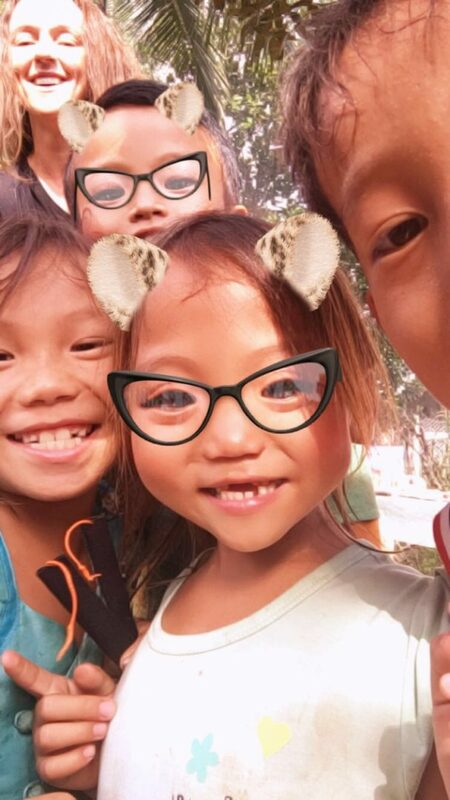 I was able to show the kids the different snapchat filters and they were immediately filled with laughter to then finally saying goodbye to them and seeing the little girls run to the road to wave goodbye to us. The second free day was a day with Elephants! Oh goodness, the moment I waited for. 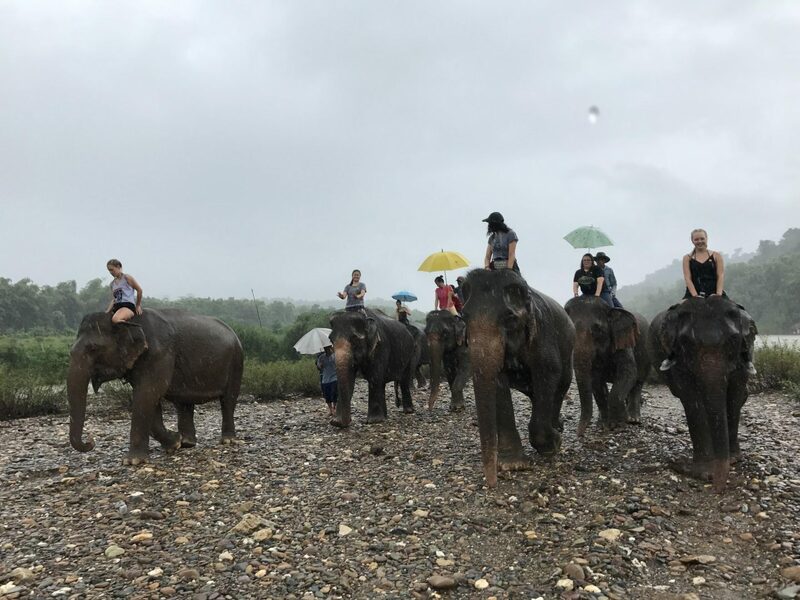 It was pouring that day, but we still got the opportunity to ride elephants in the rain, go into the river riding our elephants and feeding them. It was interesting this time for me because I was riding on my elephants bare neck and I remember when we were in the river and when we felt like we were slipping the Elephants would push back their ears to keep us on which was so reassuring to be able trust my elephant. Afterwards we got to take a little boat to Tad Sae waterfalls and swim for an hour and head back. My advice to the next group of Sailers would be don’t be afraid to explore, and try new things. Because Laos has so much to offer and has opened my eyes. Taught me that we are not only so fortunate and blessed to live so freely, but for example they have a saying “Bo pen ynang” which means it’s alright, it’s nothing. They use it so often where it shows you that we shouldn’t be holding grudges so often and dwelling on the negatives. But to accept it, to move on and be forgiving. Overall I plan on coming back to Laos when I have the funds or when the Speed train is complete, but next time I hope to dedicate it to going to villages and giving as much as I possibly can. In hopes that by that time I can speak more Lao to hold longer conversations.